Quinoa with pasta sauce is a quick-and-easy meal that feels like a healthier alternative to a big bowl of pasta and sauce. When you need to quickly get food on the table for your family, it's a go-to dinner choice. It's also great warmed up for lunch the next day. This straightforward recipe can be embellished in a variety of ways. Make your pot of quinoa and sauce and, in a separate skillet, sauté vegetables like bell peppers, mushrooms, and zucchini. When you want meat, add cooked and drained Italian sausage or ground beef or turkey. A big handful of chopped fresh herbs (like basil, oregano or parsley) also adds tons of flavor. Quinoa is a dried seed that has been grown for thousands of years in South America. It has the highest protein content of all grains and is considered a complete protein. The flavor is mild and slightly nutty, and the texture is soft and just a little bit chewy. The most common type of quinoa is white. However, you also will see red, black or mixed quinoa sold at markets. The flavor is generally the same, no matter what the color. However, red and black quinoa can have a slightly earthier, nuttier flavor compared to mild white quinoa. Red and black quinoa also can have a slightly firmer texture, and take a few minutes longer to cook than white quinoa. Using red or black (or a mix of red and black) quinoa can add eye-catching color to a salad. Rinse the quinoa if the packaging does not indicate that it's pre-rinsed. Rinsing quinoa removes naturally occurring plant chemicals that are harmless but can cause a bitter flavor in quinoa. Use a fine-mesh strainer, so you don't lose any tiny quinoa seeds down the drain. In a deep pot, bring the water and quinoa to a boil. Lower the heat, so the water is at a simmer and cover the pot. Simmer 12 to 15 minutes. If water remains in the pot, drain it off (again, use a fine-mesh strainer). In the same pot, add the pasta sauce. Stir well. Add more sauce to taste, if needed. Simmer another 1 or 2 minutes with the lid off, stirring occasionally, until the sauce is heated. Turn off the heat and let the quinoa rest for 5 minutes (with the lid on the pot). 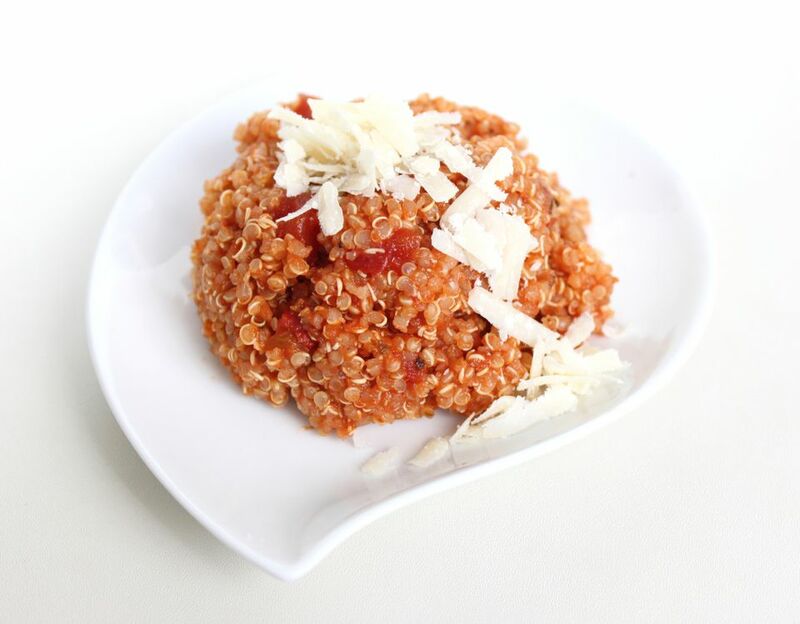 To each bowl of quinoa and pasta sauce, add a generous amount of grated cheese. To add even more flavor to the dish, consider topping the quinoa and tomato sauce with sautéed vegetables, cooked and drained Italian sausage, ground beef or ground turkey, and fresh herbs.